Accrington Stanley are the latest side to welcome Sunderland and their impressive travelling support. After two frustrating draws against tough and compact Wycombe and Walsall sides, Sunderland proved their promotion credentials by battering fellow top two contenders Barnsley, putting four past them in the process. With an already impressive goal difference of 21 before Christmas, can the men in red and white add to that figure and the more important total points one next to it? Sunderland arrive following some slightly patchy form. But all those following the Black Cats were expecting a dip after what feels like months of excellent form, quality and most importantly, wins. Wycombe and Walsall came to frustrate and did their jobs well. Add in a couple of players carrying knocks and the fact Jack Ross was maybe having to start his game changers instead of being able to bring them on later and the patchy form makes even more sense. Sunderland roared through the gears in a dazzling first half performance against promotion rivals Barnsley but seemed to take their foot off the gas after the third goal went in. Barnsley tried to sneak back into the game with two goals of their own. But the red hot Aiden McGeady wasn't about to let that happen and set up super sub Luke O'Nien who happily struck a fourth past the Tykes stopper. After a rather flat affair of having to play Walsall twice in less than seven days which resulted in a turgid draw in the FA cup fixture, Jack Ross started a number of fringe players and others returning from injury in the Football League trophy game against Notts County. Demonstrating the impressive strength in depth the Sunderland manager now has at his disposal, several players took their chances to show that they deserve a taste of regular first team action. None more so than the returning Duncan Watmore. The Roadrunner didn't look like a player making a comeback from a second major ACL injury in two years. In fact he absolutely terrorised the Notts County back four, showing his blistering pace and excellent movement to fashion a number of opportunities as proof he hasn't lost any of the skills which made him so dangerous in the Premier League era. 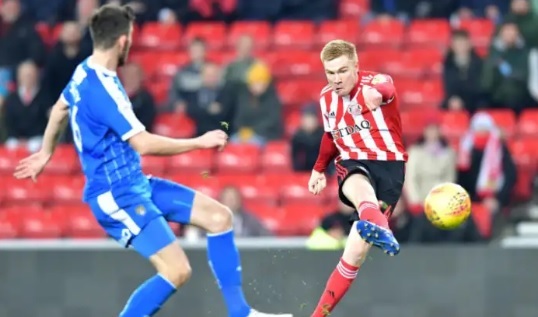 Jack Ross said midweek that it is unlikely Watmore will be involved today, but it's good to [almost] have him back. Accrington Stanley on the other hand have enjoyed a fairly consistent start to the season, managing seven wins, seven draws and six losses. Very impressive from the newly promoted side, but saying that Luton are absolutely formidable at home so the newly promoted name tag doesn't seem to be holding teams back. They are currently enduring their own dip in form which has seen them go seven games in the League without a win. Cup form has been better resulting in two wins against lower league opposition. But Lincoln City did take them all the way to penalties in the FA Cup which Stanley won 4-2. They'll be hoping to turn this around today in front of a bumper crowd at the Crown Ground, or Wham Stadium if you like a bit of corporate branding, in what is expected to be a record turn out for a Stanley game. Jack Ross has been eyeing a busy festive fixture schedule but is delighted to have a strong squad to pick from. “The only thing we can ever effect is our own results and if we continue to do that in the manner that we have done to this stage and we keep replicating that points per game or close to that, we’re going to have a really good chance of getting promotion regardless of what other teams do. “So, yes, I’ll look, but it’s not really at the forefront of my mind when a game finish. “I think that at the moment we know that as long as we continue to control what we’re doing and effect what we’re doing, then we’ll be ok.
“Where we’ve came from in the last couple of years and where Accrington have come from means that we’re meeting in that middle point. “A new environment for us to go into, but against a team that has performed well in League One, considering they’ve only just been promoted." It is these three players that create the space for everyone else to thrive, they go wide to stretch teams but they all have the quality and trickery to cut in and cause problems themselves. They've all got goals and assists under their belts and I don't expect this to stop. Up front will be the impressive goal threat and quality of Josh Maja who needs the slightest sniff of a chance to score. Who thought we'd have a teenage academy product into double figures in the goal scoring department before Christmas? In all honesty Stanley are in a rotten patch of form and need to pick some wins up before the Christmas fixtures start to punish poor form. Sunderland seem to have endured their own mini dip and have a formidable squad of quality players to pick from. With a good atmosphere expected and with so much competition for places I expect Sunderland to enjoy themselves this afternoon, giving the travelling support something to cheer about and rival teams something to think about (and maybe even fear?). 3-0 Sunderland (no disrespect to any Stanley fans reading this).